The Agility Bed uses a combination of latex, micro coils and memory foam to create a balanced feel with good support and pressure relief. Agility also comes from an established manufacturer. The micro coil layer provides better airflow than a foam layer and increased bounce for less of a stuck feeling. This hybrid mattress from Therapedic is specially designed to provide you with instant comfort the moment you lay down on it, with the overall intention of helping you to fall asleep quickly and get the most out of your rest. It’s said to be particularly helpful for anyone who has a full and active lifestyle and needs to get a restful night’s sleep. It’s also a great choice is you want a mattress that is very responsive and will adjust to any movements you make while resting. Seek great airflow & cooling – 1st of all Agility uses latex on top. Latex generally sleeps cooler than most other foams. In addition, the latex is aerated which allows great airflow. To take it to another level the 2nd layer is micro coils that offer way more airflow than having another solid foam layer 2nd. This mattress sleeps nice and cool. Want a good combo of bounce and pressure relief – The top latex and micro coil layer provide a decent amount of bounce without being too much. The memory foam layer under the micro coil adds pressure relief and additional body conformance. The design of this mattress provides a great feel. Want something more than a 10″ foam mattress – We see a lot of 10″ foam mattresses coming out with little innovation. It was nice to see a new design element that is meaningful to the performance of the mattress like the layering they have in the Agility Bed. Want a responsiveness mattress. If you want a mattress that will adjust to your every movement, this is the perfect mattress for you. It will adapt to your sleeping position and conform to your body to provide truly spectacular levels of both support and comfort. Want a medium (or medium-firm) mattress. 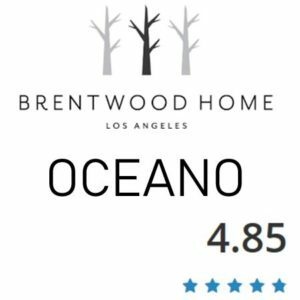 A mentioned previously, this mattress has a firmness level of 5 or 6 (on a scale of 1 to 10), making it a great choice for anyone who wants a mattress that isn’t too soft or too hard. 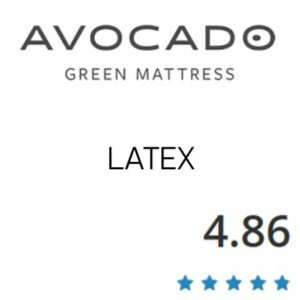 Want a mattress with good temperature regulation. 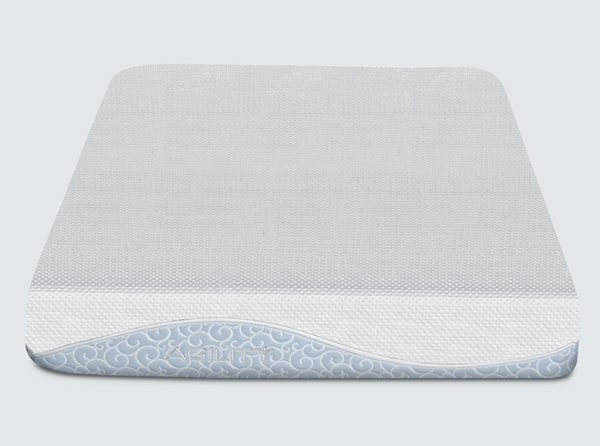 Thanks to the unique design of this mattress, which incorporates latex foam (which is naturally aerated for better heat dissipation and breathability), gel memory foam (also good for temperature regulation), and micro coils (which allow for better air flow and heat dissipation as well), this mattress is a great choice if you tend to get overheated at night or if you simple want something that stays cooler while you sleep. Want a hybrid mattress. 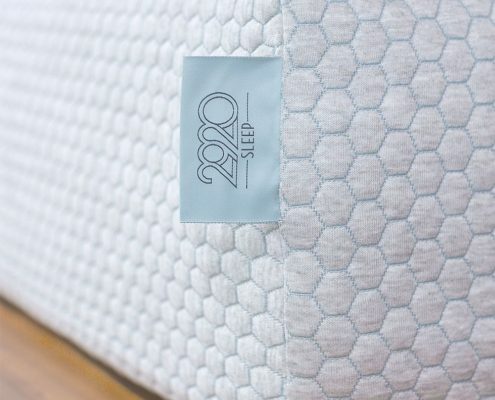 This mattress incorporates latex foam, gel infused memory foam, and pocketed micro coils and as such offers a unique sleep experience that combines pressure relief and support with plush and body-conforming comfort; It is also incredibly responsiveness to your movements. Overall, this is a great choice if you want a mattress that takes all the best qualities of other types of mattresses and combines them into one great mattress. 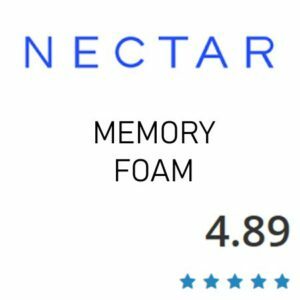 Prefer a traditional memory foam feel – Agility using latex and micro coils means it has less sinkage and body hug than memory foam. The memory foam in this is 2 layers down so you still have the benefits of memory foam but it has more of a floating/sleeping on top of the mattress feel vs memory foam. Prefer a hybrid – Although Agility uses a micro coil unit if you want a hybrid or traditional coil unit as a base of the mattress you’ll want to look elsewhere. This provides good bounce with latex and micro coils but it still uses a foam core. Most boxed mattresses that are compressed for shipping will give off some smells when you’re first unpacking them; this occurrence is called off-gassing, and is a totally normal by-product of the compression process that is used to make the mattresses easier to ship. 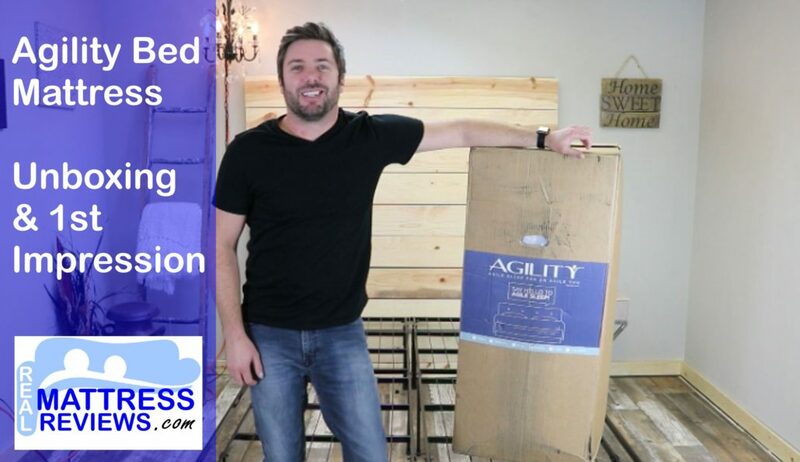 The Agility Bed mattress, unlike many other bed-in-a-box mattresses that can be purchases online, features minimal off-gassing; there might be a faint aroma when you first unwrap your mattress, but the smell should dissipate very quickly. This minimal off-gassing is thanks to the fact that the Agility Bed mattress is made entirely in the USA and out of high quality materials, and as such there are minimal chemical emissions; the majority of the off-gassing scent will actually be from the wrapping plastic rather than the mattress itself. This mattress is specially designed to provide you with a combination of support and comfort while also offering a level of responsiveness that is far superior to that of other online mattresses. 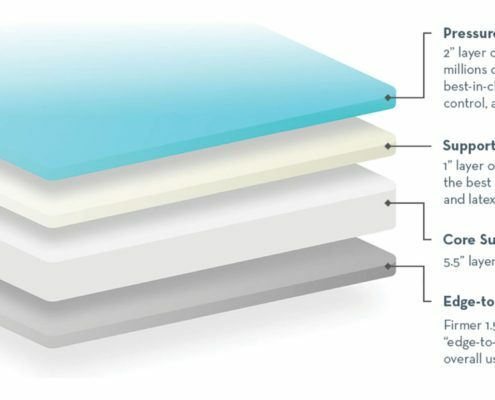 The unique combination of latex foam, pocketed micro coils, and bio-based gel memory foam is able to offer pressure relief and support for your back, joints, and muscles while also offering body-contouring comfort that adjusts to your movements while you sleep. Overall, the surface of this mattress is designed to be agile and move with you, hence the name “Agility Bed”. Because this mattress is designed to adjust and adapt to your own unique needs, it’s a great choice no matter what position you sleep in. 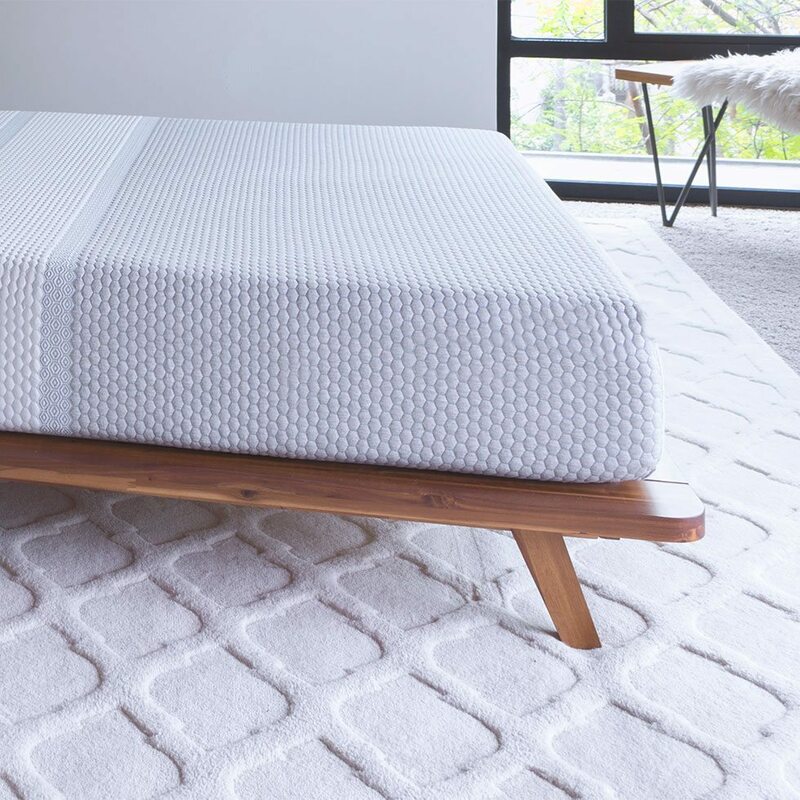 Whether you sleep on your back, on your side, or on your stomach, the Agility Bed mattress will adjust accordingly and provide you with an ultimate sleep experience with excellent levels of both comfort and support. On an average firmness scale (of 1 to 10), most people rate this mattress at about a 5 or a 6 level of firmness, meaning that it has a medium to medium-firm feel that makes it ideal for just about everyone, since it is not too hard and not too soft. 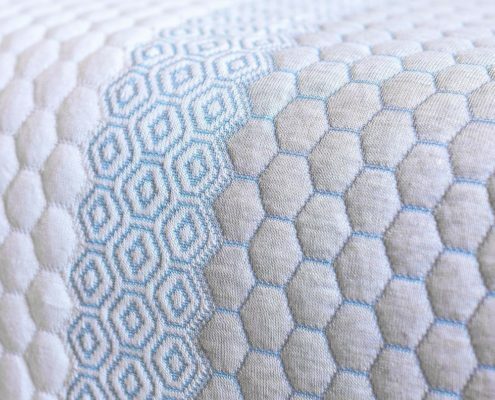 This mattress also features little in the way motion transference (the phenomena that occurs when movement in one part of the mattress creates a disturbance on the rest of the mattress), but it is important to remember that because this mattress is designed to be more responsive there might still be some faint vibrations felt when you move on the mattress. 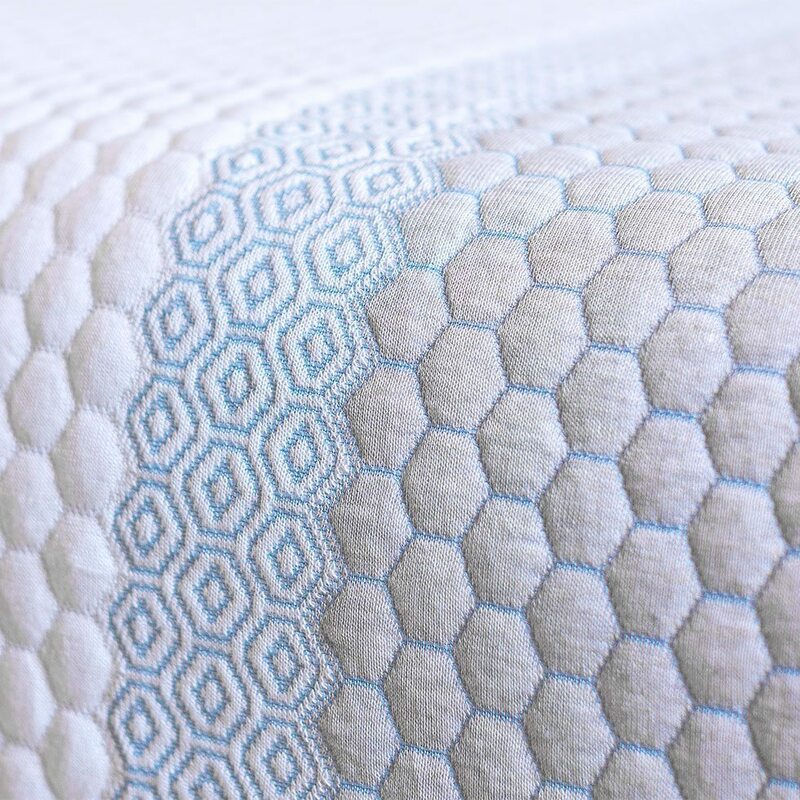 As a result if you or your bed partner are sensitive to vibrations or motion transference when you sleep and want something that provides more complete motion reduction, this might not be the right mattress for you. 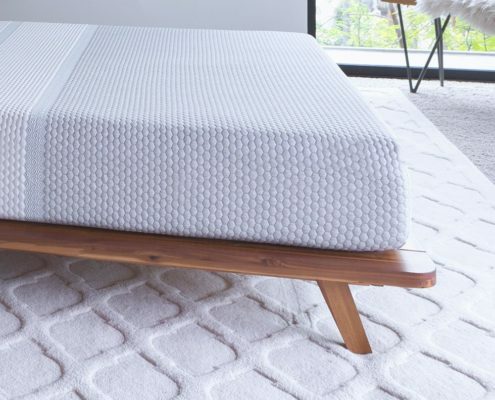 That being said, the gel memory foam layer and the strong base foam layer are great for reducing the overall impact of movement, so any vibrations you do feel will be quite minimal and contained to the top layers of the mattress. This mattress, unlike quite a few other box-in-a-bed mattresses, does in fact have a very solid and dependable edge. This is thanks to the combination of high quality memory foams and individually pocketed micro coils; this combination in tandem with the strong base foam provides this mattress with high levels of stability of support throughout its entirety. 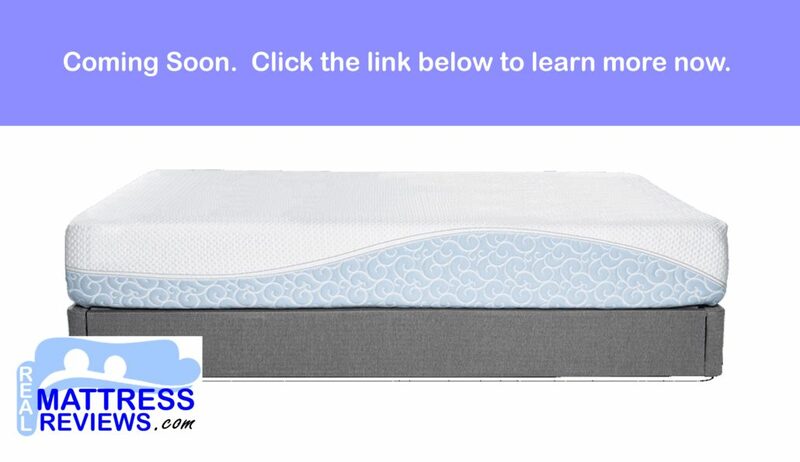 Overall, there is a consistent feel throughout the entire mattress, and while the edges might be slightly less supportive than the rest of the mattress it is not a difference that is overly noticeable; unless you make a habit of sleeping right on the edge of your bed or sitting on the edge or long periods of time, you will likely never experience any problems with the Agility Bed mattress’s edge support. The Agility Bed mattress is a specially designed hybrid mattress, and as such is made up of four primary layers (all of them a different material): latex foam, pocketed micro coils, gel memory foam, and base foam. The top layer is comprised of five-zoned latex foam. This latex foam is designed to be incredibly breathable while also providing body-conforming comfort for you the instant you get into bed it also adjusts to any movements you makes while in bed. It is also Oeko-Tex Standard 100 Class 1 Certified, meaning that it is guaranteed to be safe to use even for babies and young children. The second layer is made up of micro coils. There are about one thousand micro coils in total, and each and every singe one is pocketed and encased in a specially designed stretch fabric that responds to movement. These coils are particularly helpful for making this mattress incredibly responsive; these mini pocketed coils in tandem with the quick-reacting latex foam make it so that the Agility Bed mattress adjusts right away to any movements or changes of position while you sleep. The third layer of the Agility Bed mattress is made up of bio-based gel memory foam. This gel memory foam is notable for how high-quality it is not only is it made without ozone depleters and CFCs (chlorofluorocarbons), it also does not contain any PBDEs, TDCCP, TCEP flame retardants. It also is also made without formaldehyde, and is emissions-tested (with confirmed low VOC emissions) to ensure that it isn’t harmful to the environment. In any case, this gel memory foam layer is a very effective transition layer; it helps with energy absorption and also helps to provide pressure relief. The fourth and final layer of the Agility Bed mattress is made up of a sturdy base foam that provides the mattress with support,durability, and stability. The foam used in this layer is, like the third layer, made without ozone depleters and harmful chemicals, and is also emissions-tested for environmental health and safety reasons. The Agility cover is also stretchy and stays tight on the mattress. More to come.. The Agility Mattress will work great on any solid surface. The floor, platform slats, boxspring/foundation and they now offer an adjustable base as well. Although we didn’t film the Agility on a base you can be sure it will work fantastic on an adjustable base. 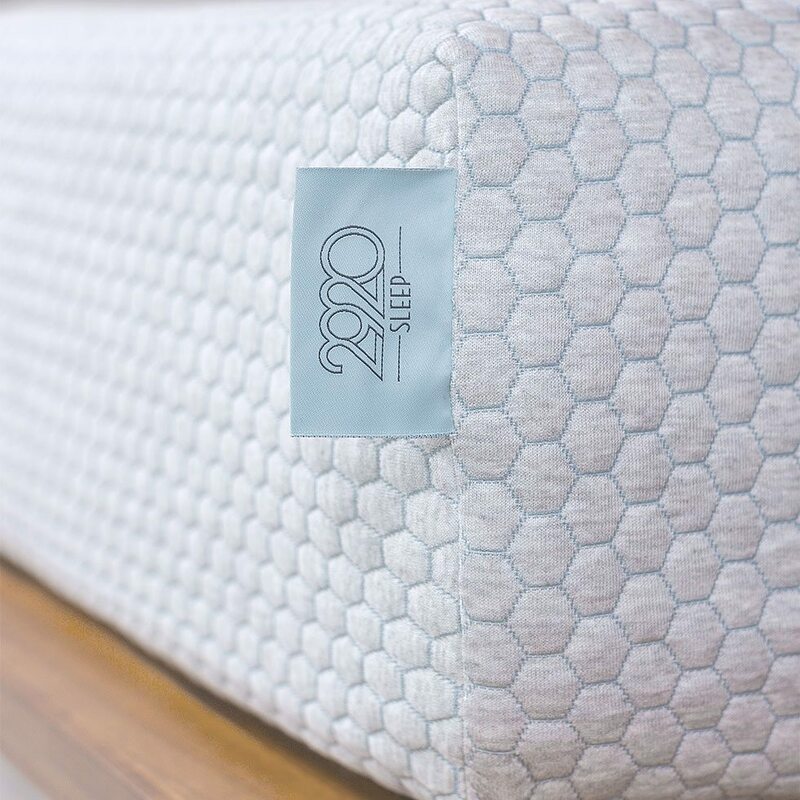 This mattress comes with a one hundred day trial period; this trial offers you over three months’ of time to try out the mattress and decide whether or not it’s the right choice for you and your individual sleep needs. Also, if you do end up deciding that the Agility Bed mattress is not the right mattress for you, the process for getting a refund is fairly straightforward and easy. Furthermore, rather than having you pay for shipping and handling to return the mattress to the company, they instead suggest that you donate it to a charity in your area, so that it can be given to someone in your community who will benefit from it. The Agility Bed mattress also comes with a full warranty for a single year, and a limited warranty for ten years. While this sort of warranty arrangement is fairly typical for the mattress industry (especially for mattresses bought online), it’s still reassuring to have such a warranty since it assures you, the customer, that should anything go wrong with your mattress you can contact the company and they will strive to resolve the situation for you as effectively as possible. If you still aren’t sure whether to Agility Bed mattress is a good option for you or not, we suggest reading the reviews left by others who have purchased and used this mattress. After all, feedback from other customers is an important part of the decision-making process for any shopper. “Really couldn’t be more happy with our Agility mattress. My wife and I genuinely look forward to going to bed each night. It’s that comfortable. I’m a side sleeper, so support for my hips and shoulders is critical. This mattress allows heavier pressure points to sink appropriately making my whole body feel cradled. Very happy with my purchase.” – Brandon. “I was fortunate enough to win an Agility mattress in a sweepstakes recently. The mattress on our bed was very old and tired, so I was very excited. I was also skeptical about getting a rolled up mattress in a box. It arrived very quickly after being notified. My husband and I hauled the box into the bedroom , and we leaned our old mattress up against the bedroom wall – just in case we wanted it back on the bed! It was very easy to set up – took no time at all. That night I slept through the night for the first time in months. I’m not a good sleeper, and am usually up several times during the night. Since sleeping on the Agility I have been able to go back to sleep if I wake up without a lot of wrestling around. My 10 year old dog, who hasn’t slept with us for a few years, has now taken up residence in the middle of the bed each night, and is still there when we wake up in the morning. I guess Agility needs to look into making dog beds next! We will be taking our old mattress to the dump this weekend, and are definitely enjoying our new Agility mattress! Thank you! !” – Kim. “I ordered the twin bed for my 3 year old and he has said more than once “Mama, I love my new bed!” He often refers to his bed as “cozy comfy” – and believe me, it is. Before we received our Agility mattress, my son was on a week-long nap strike. After we setup his new bed, he started napping again with no issues – and not wanting to wake up! He also falls asleep faster at night with his new bed. Just shows how important a good mattress is for all of us. Now I want one!” -Anna. “The whole Agility experience was fantastic – easy ordering process, quick delivery and the mattress is as comfortable as promised. My wife and I had a wonderful, restful night’s sleep. Would definitely recommend purchasing your next mattress with Agility!” – Lenny. “I was a little concerned about buying my daughter a mattress online. However, once we set-up her new Agility mattress and let it expand, a supremely comfortable mattress came to life! And once I slept on the mattress myself, I knew I’d made the right choice. It’s super comfortable!” -Brenda. We really liked the overall feel and performance of Agility. The following are more things that we liked. “"Ross, your website was a huge help during our search. We thank you for the great reviews and prompt responses to our questions."